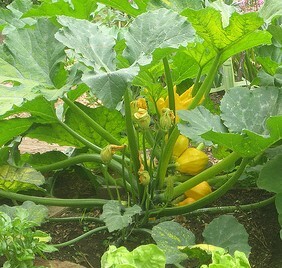 Who's picking their first summer squash? Will be interesting to see, from South to North, whose crops are ready when, as the season progresses. Direct seed or transplanted? Last edited by Bob Perry on Wed Jun 13, 2012 12:59 pm, edited 2 times in total. Re: Who's picking their first summer squash? My neighbor's been picking/eating squash from his garden for over a week. We have had a couple messes. Got planted a little late, but have eaten some already and have put some up. Been getting squash and zuchinni about 2 weeks now. 37 qts of beans in the jars, 5 pints of beets, about a gallon of g. peas, some orka, cukes, and oh yes, about three real tomatoes. plus corn on the cob Sunday! Watermellons and 'lopes well on the way. Bout forgot the taters, 100# of reds and 50# white, life is good! Actually brocolli and cabbage were first to pick. transplanted and have got about 6 squash in the last 2 weeks and first 3 cucumbers today. Planted seeds. Can not remember when I picked the first ones but it was around a month ago. Planted seed, been picking about 2 weeks now. Probably picked 40 lbs. my last picking, didn't get in the garden this morning, it's been a gully washer in NE Georgia this morning. Been getting cabbage, cucumbers, onions, peppers, tomatoes, radishes, lots of summer squash. Got egg plants not quite ready yet and lots of winter squash about ready, small green beans on the plant, butter beans blooming, and corn that should be ready in a week. It's been a bad year for okra for some reason. I've planted three times and still don't have a complete stand. Other than Okra it's been a good spring for gardens. I planted mine early and had to protect my tomatoes once from a late frost. Lots of rain this year. We are being very blessed this year. Picked the first squash yesterday. Seed planted May 1st. I have been eating squash for over a month. Mine has basically finished. I will be planting a second crop in a few weeks. The 3 inch rain we got a couple of weeks ago plus some evening watering has kicked things in high gear. Based on the blooms and nubs, it's going to be a bumper crop of squash. Peas are coming along, okra is about waist high, but corn is only knee high. Next year I'll be able to plant corn and side dress with fertilizer at the same time. Gonna simmer these in a skillet with onions.......yum! Yup we just started picking on Tuesday. Ed are those the same varmints that you said you stuck a John Deere hat down the hole, and they moved out ?? ?